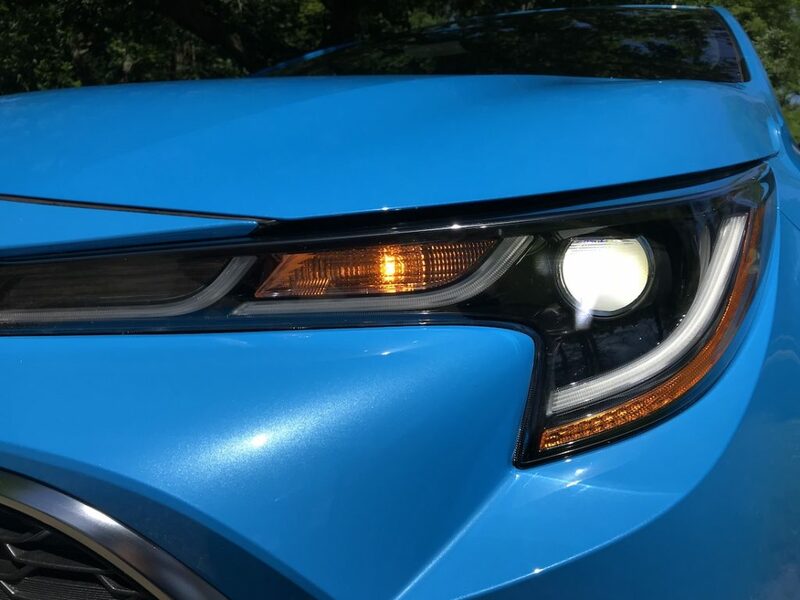 Toyota surprised us this past spring with the “unhatching” of the new Corolla Hatchback. 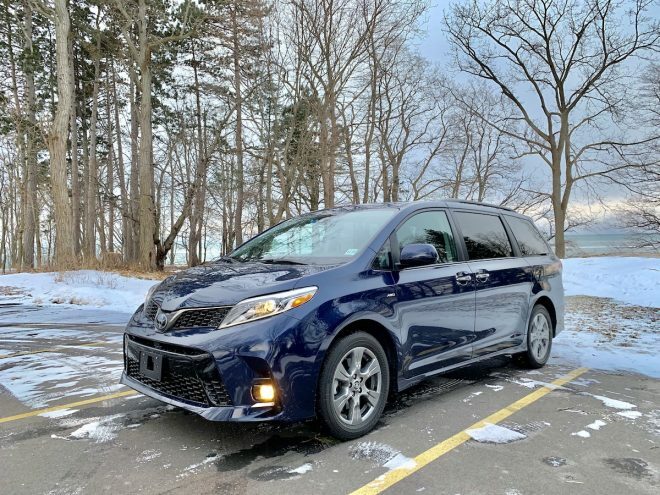 Fun, fuel-sipping cars have taken a back seat to crossovers, SUVs, and trucks as of late, but Toyota continues to serve those who don’t need the space consumption of a large vehicle, while providing arguably more tech than any other Toyota currently available. 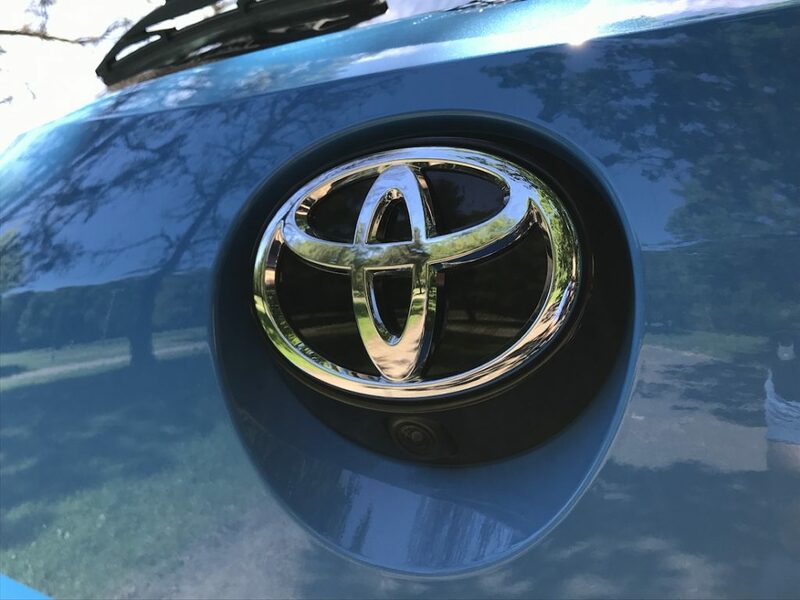 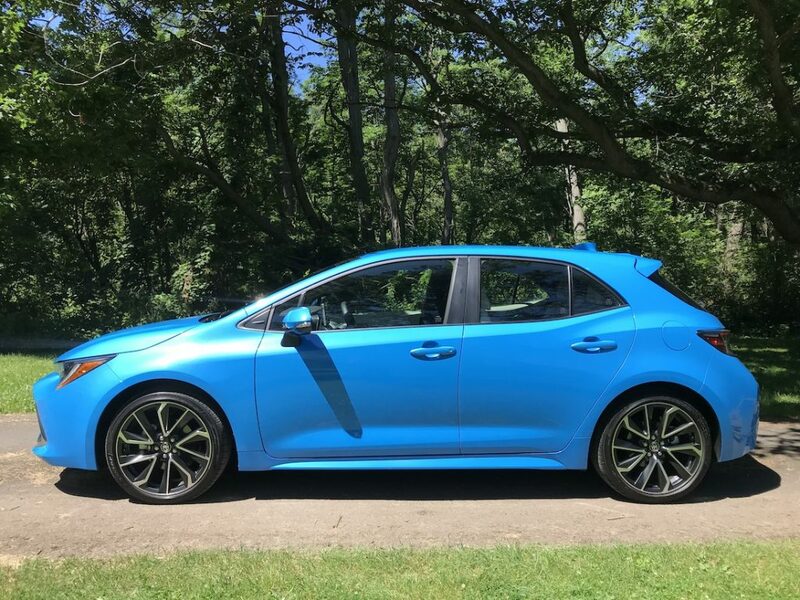 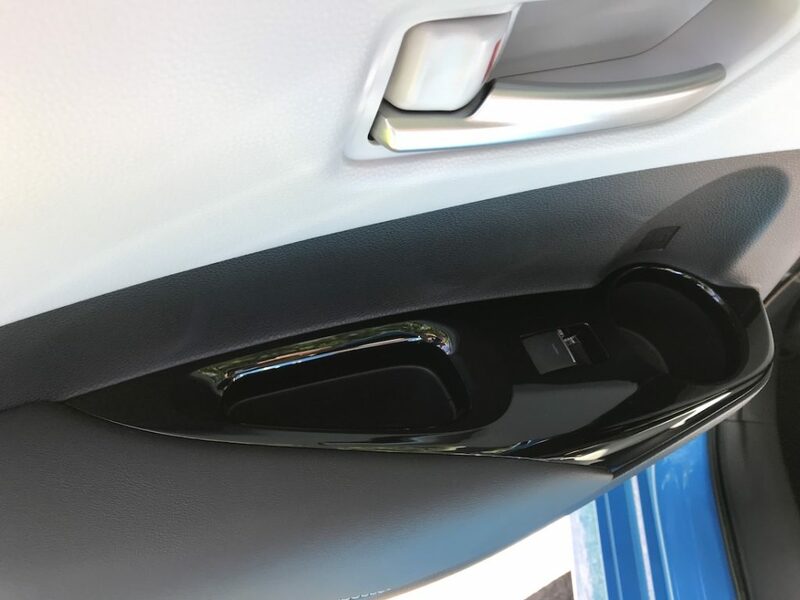 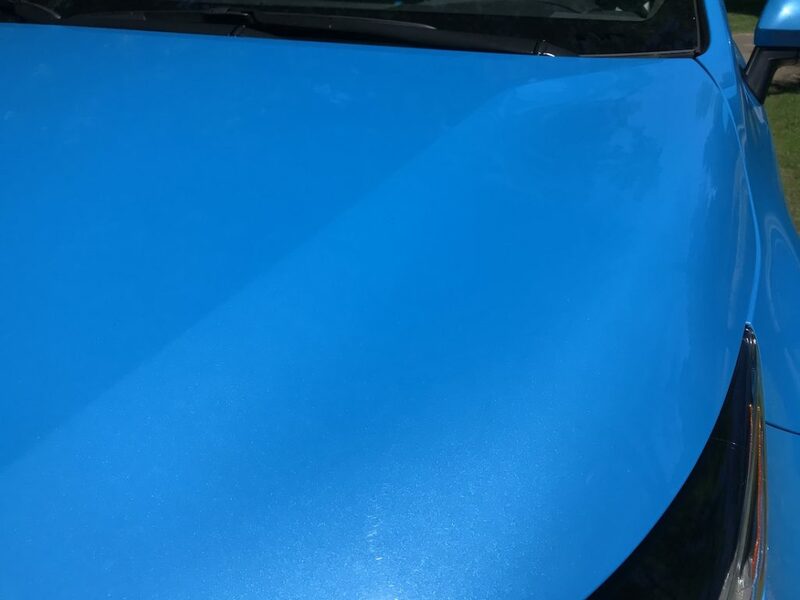 What immediately stands out is the new “blue flame” metallic paint that makes this new hatch unique. 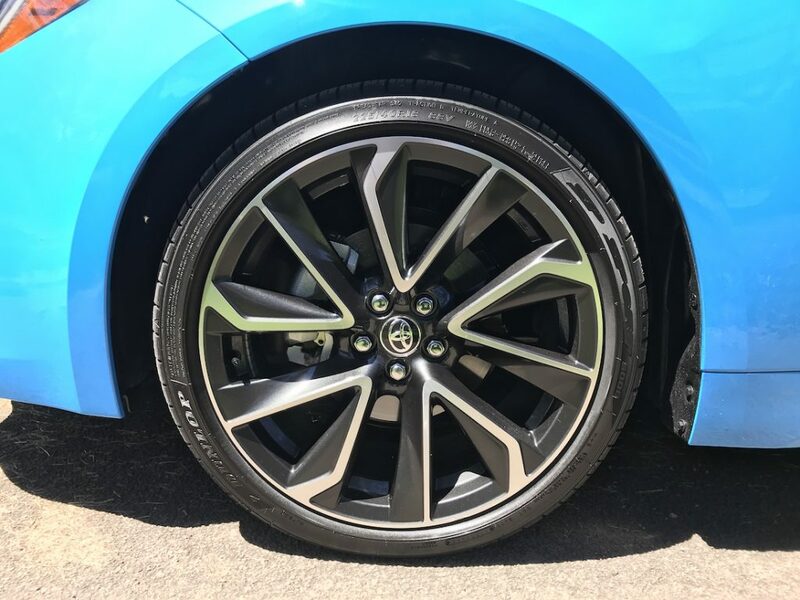 We love the color and wheel design. 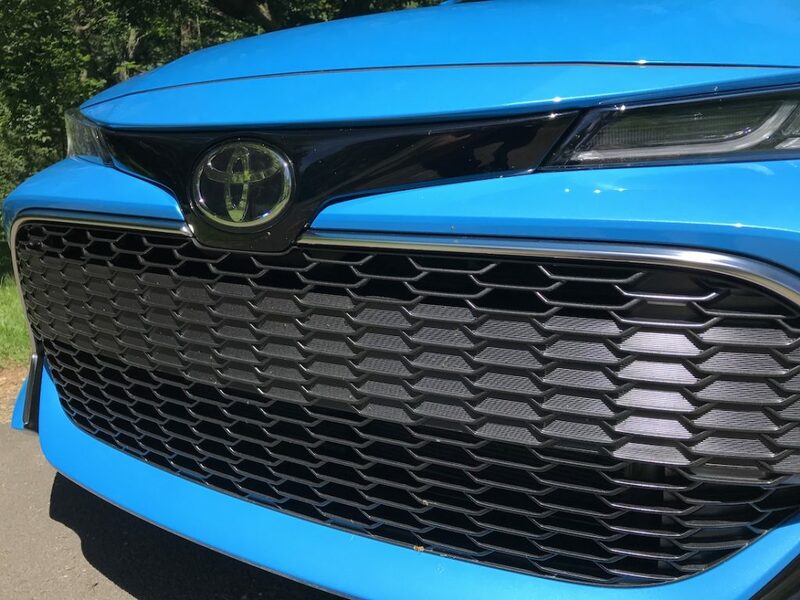 The exterior is definitely exciting and desirable now, with LED lighting all around and signature Toyota characteristics. 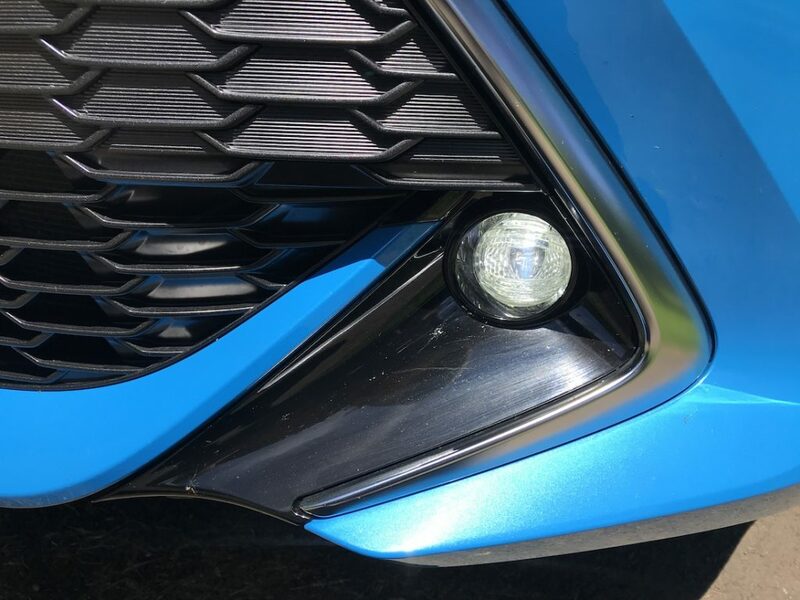 The adaptive LED headlights with automatic high beams are standard and extremely bright at night. 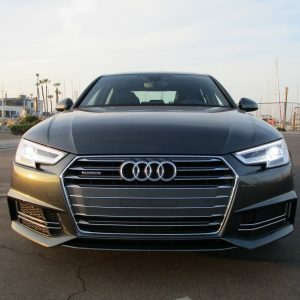 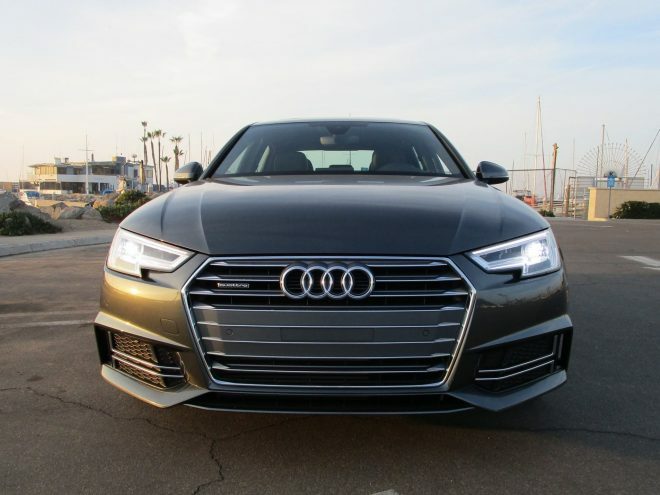 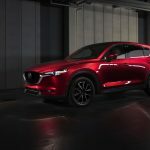 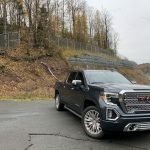 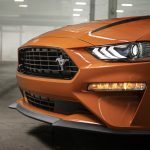 The camera monitoring the roadway quickly switches between low and high beams, and the LED turn signals grab the attention of other drivers better. 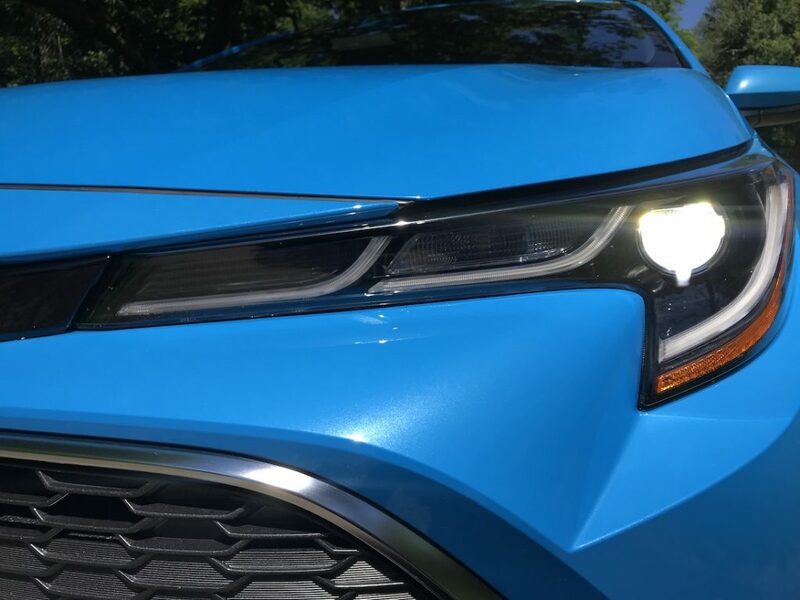 The Corolla Hatchback packs a new 2.0L direct-injected engine. 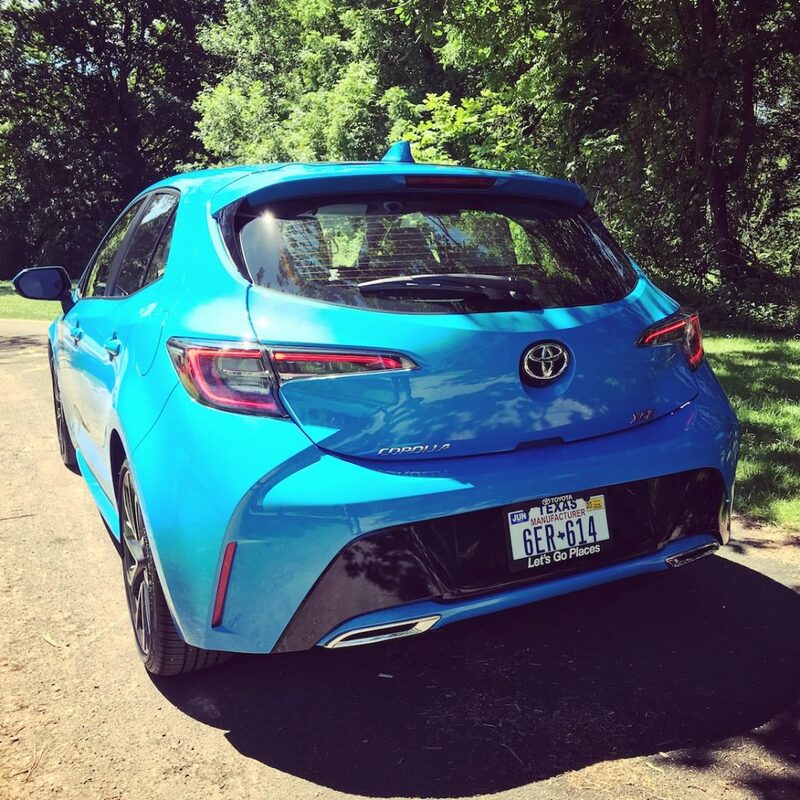 It’s smaller, lighter, and quieter than the Corolla sedan’s 1.8L engine, and more efficient too. 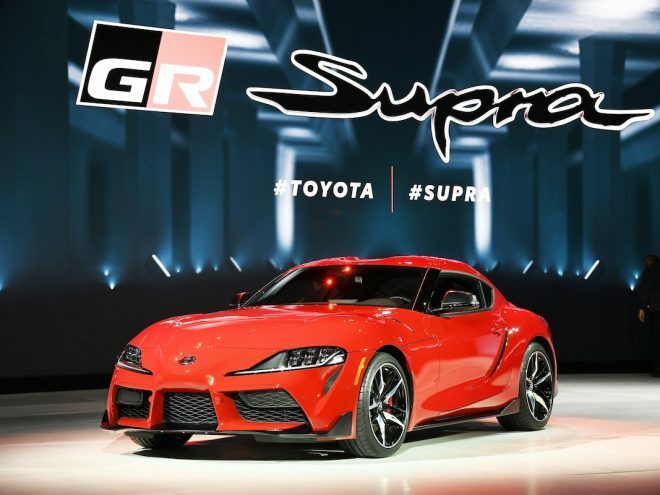 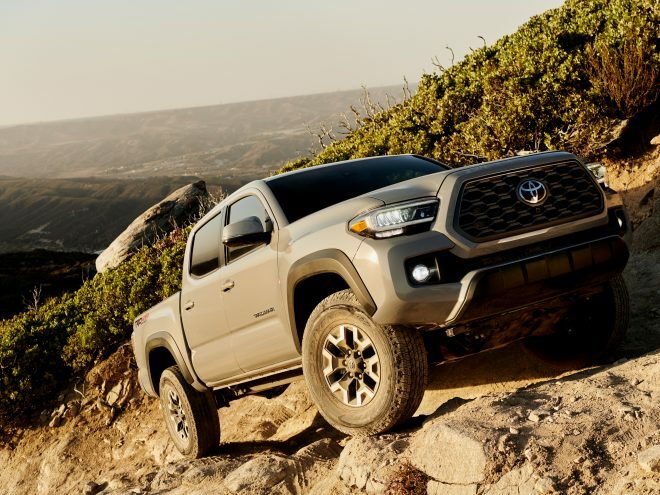 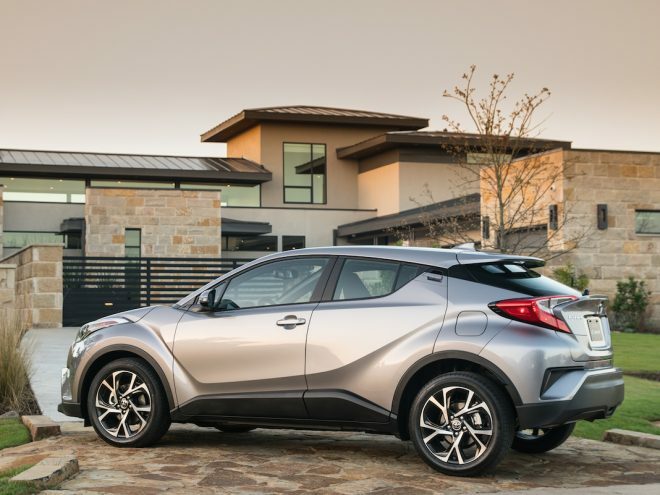 The engine produces 168 horsepower and 151 lb-ft of torque, routing it through an innovative CVT that features the world’s first “launch gear.” Toyota developed and added this first gear to improve acceleration, driver confidence, and fuel economy. 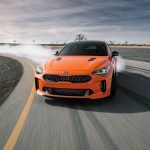 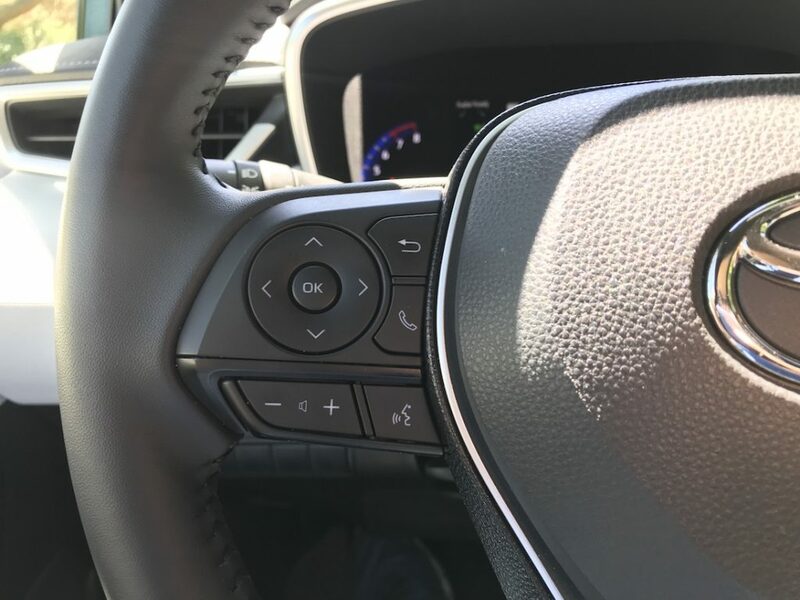 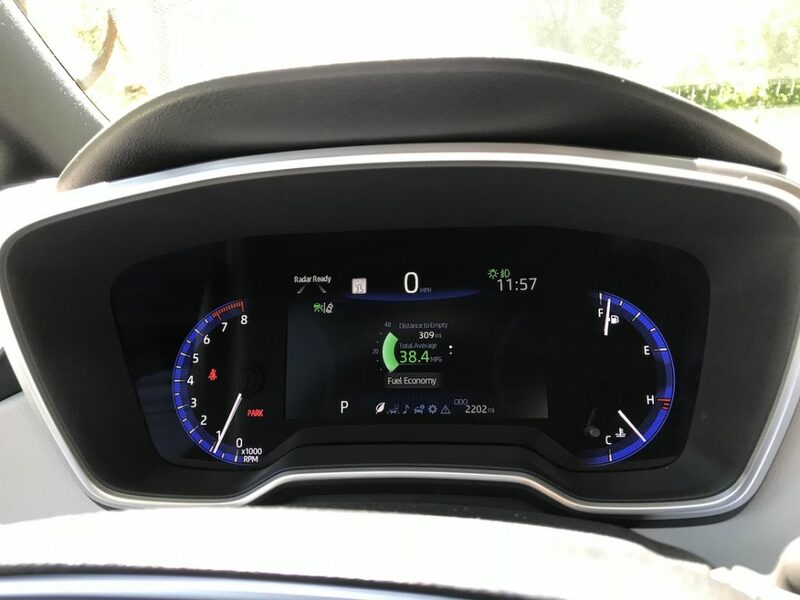 The new CVT has the ability to simulate 10 gears in manual mode via the paddle shifters, and a Sport mode allows high revs and heftier steering. 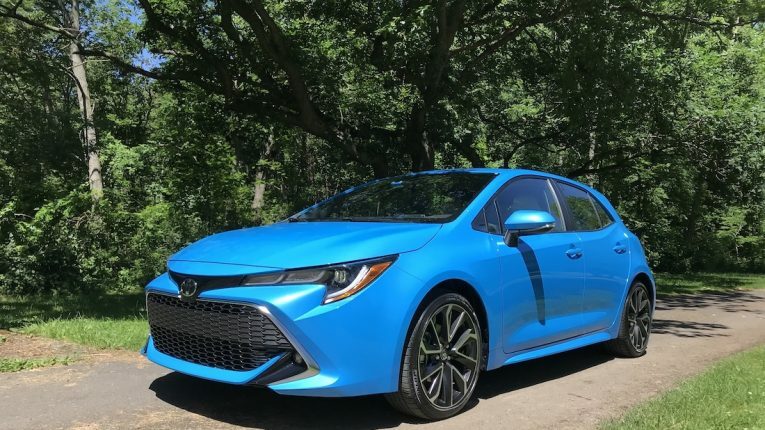 Also like the Corolla sedan, a 6-speed manual is available, but this one is new and one of the lightest in the world at 88 lbs. 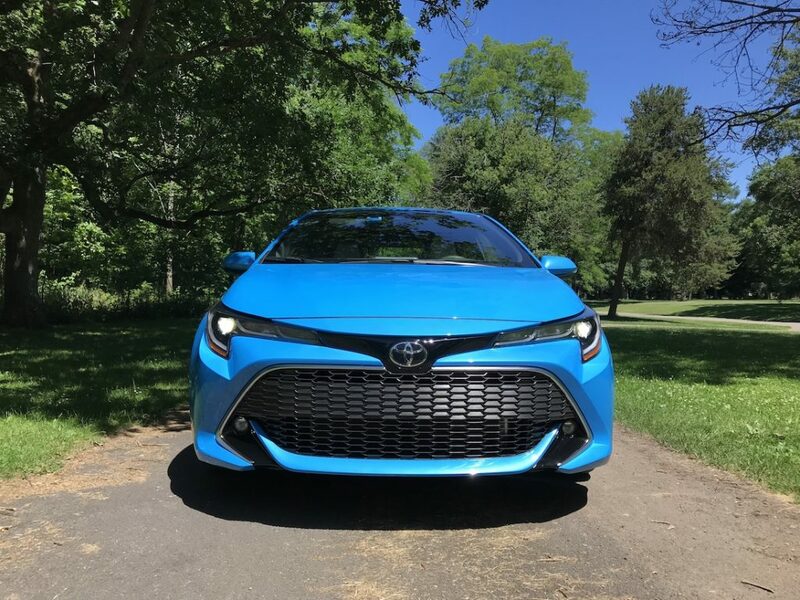 We have to give Toyota engineers kudos for really balancing the power to weight ratio, and instilling confidence in the driver. 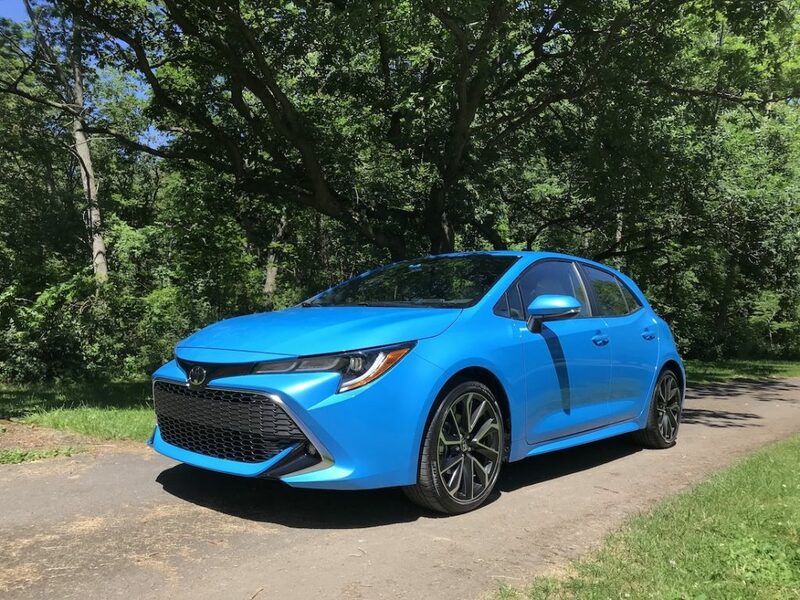 The steering and suspension also work in tandem to make this the most fun to drive Corolla we’ve ever tested. 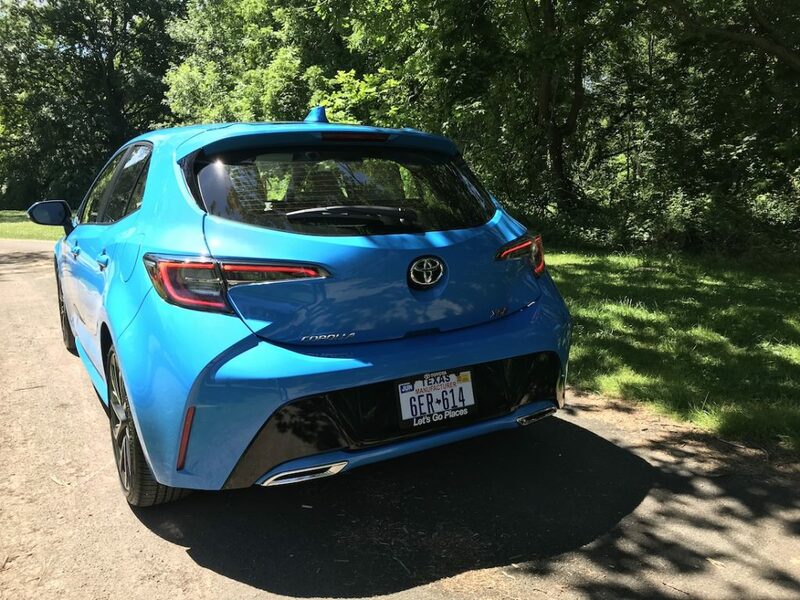 The suspension isn’t harsh, yet it still corners flatly and feels alive. 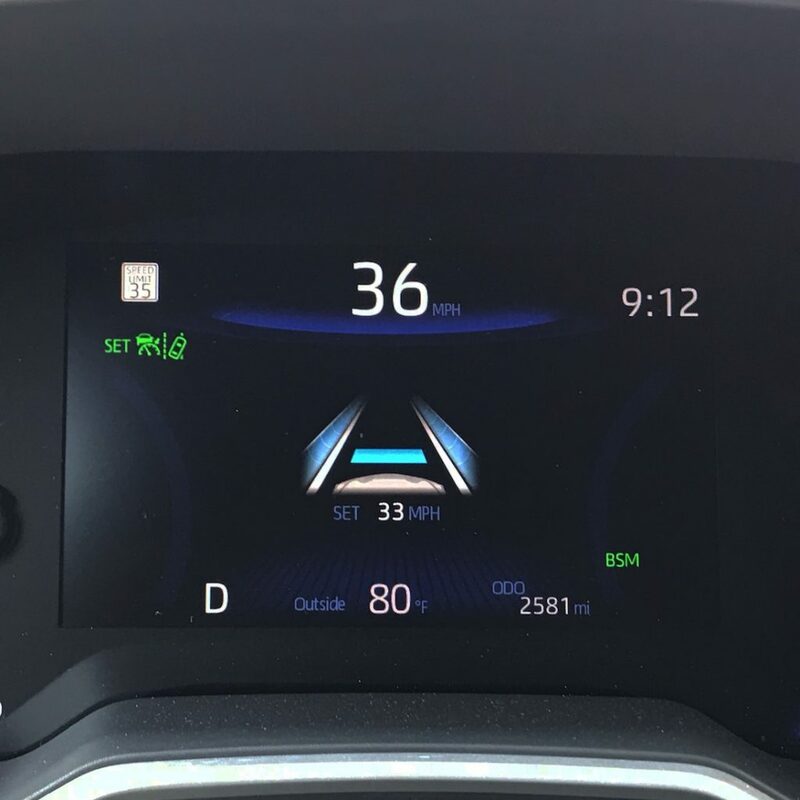 Fuel economy after a week of mixed driving averaged 38 mpg, which is astonishing. 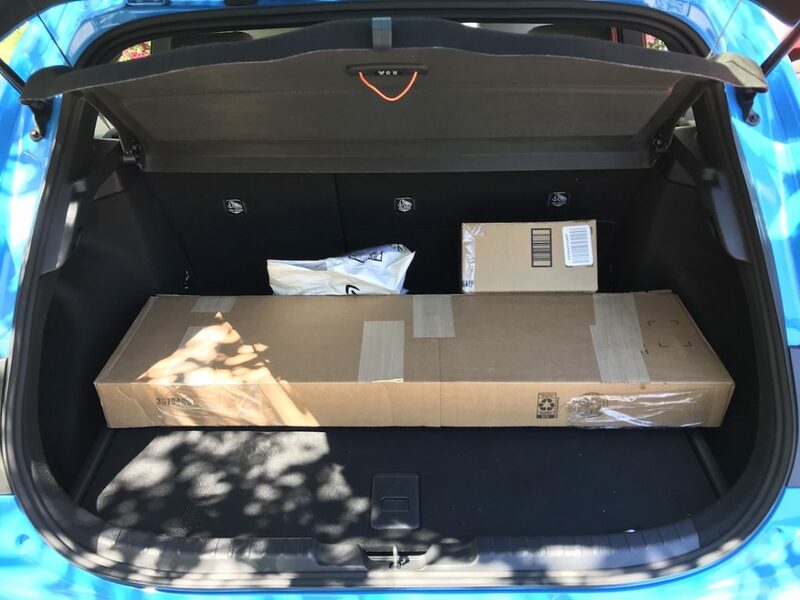 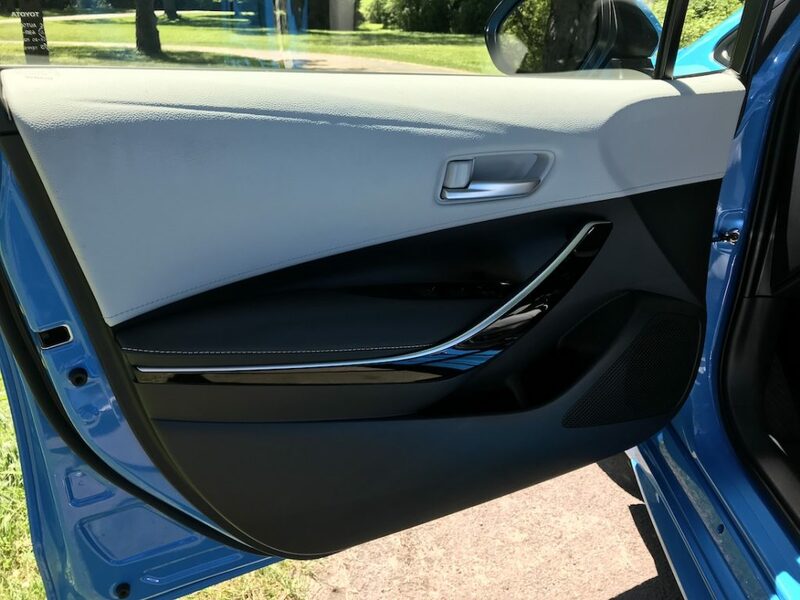 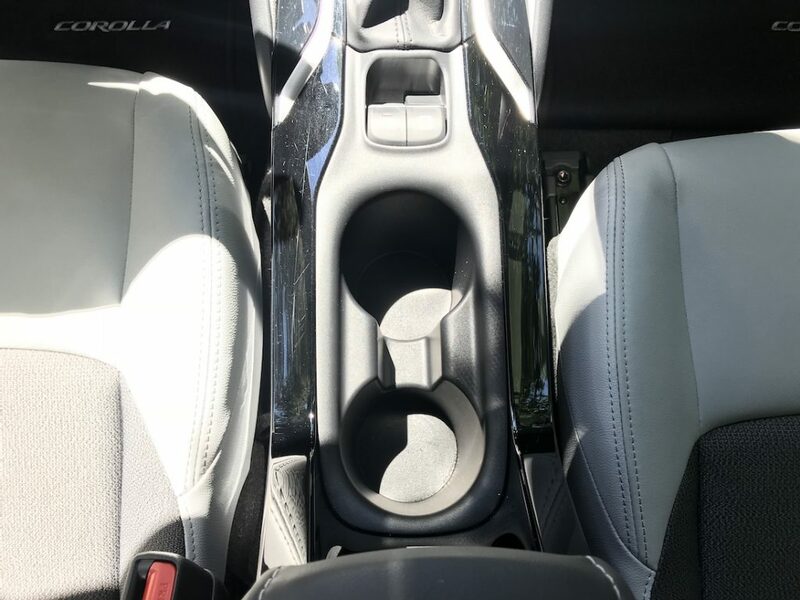 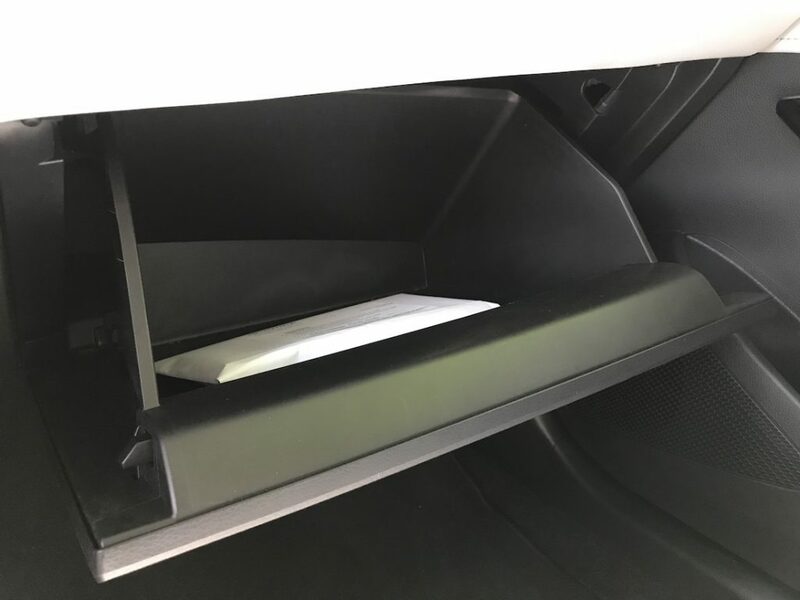 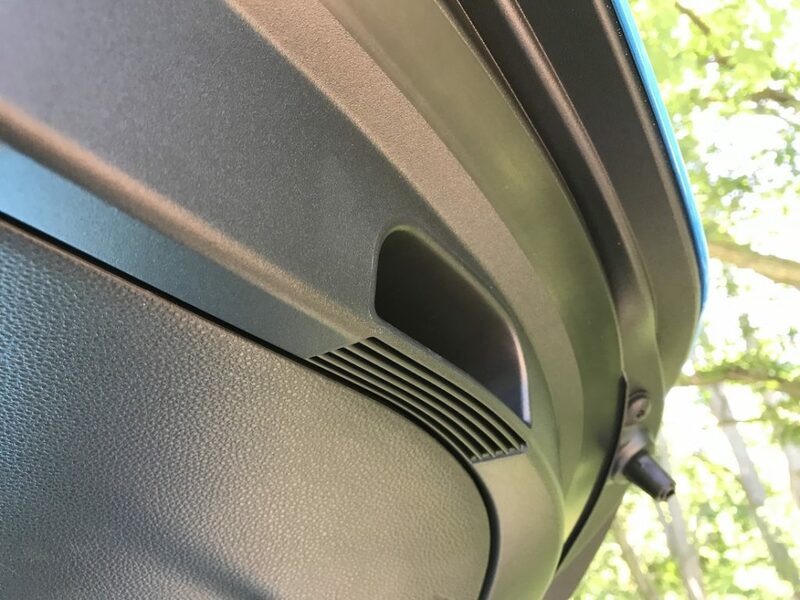 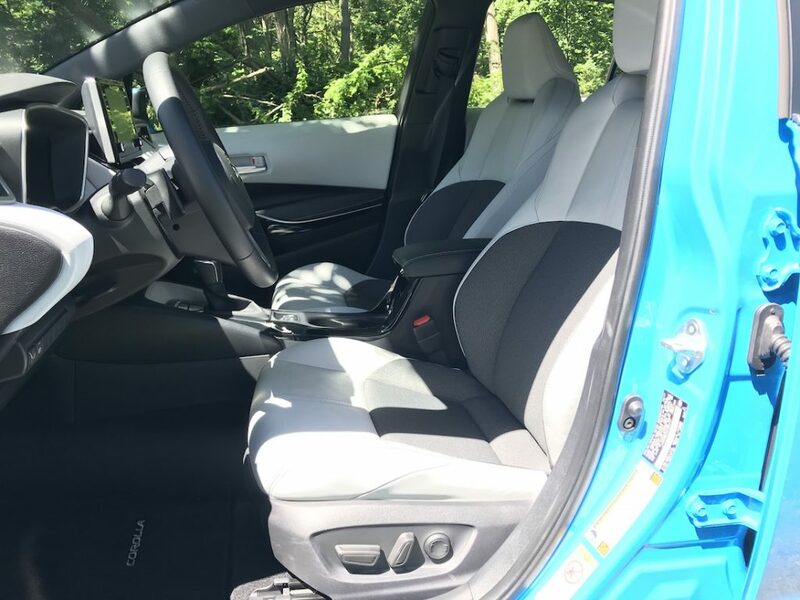 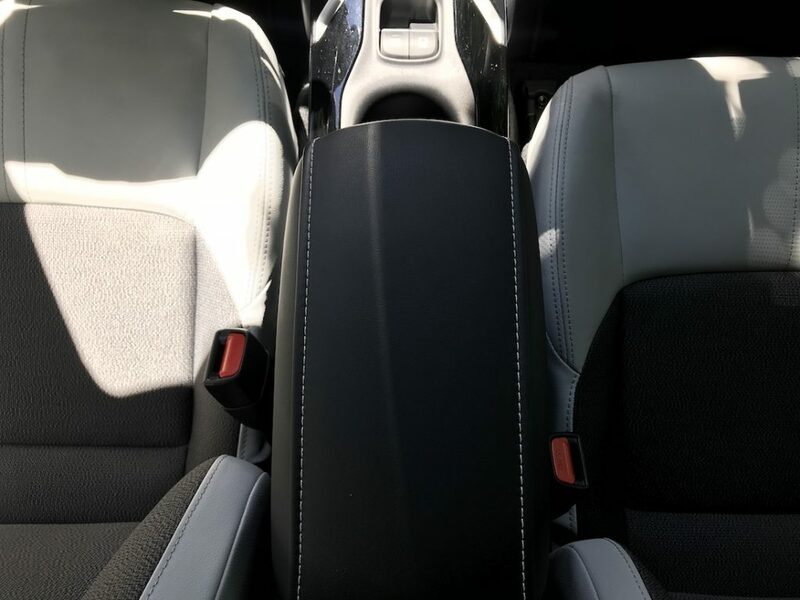 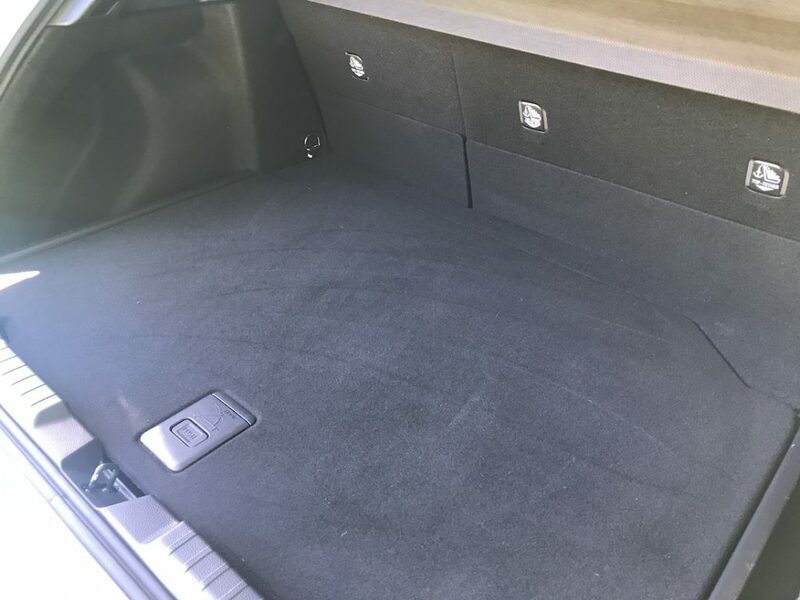 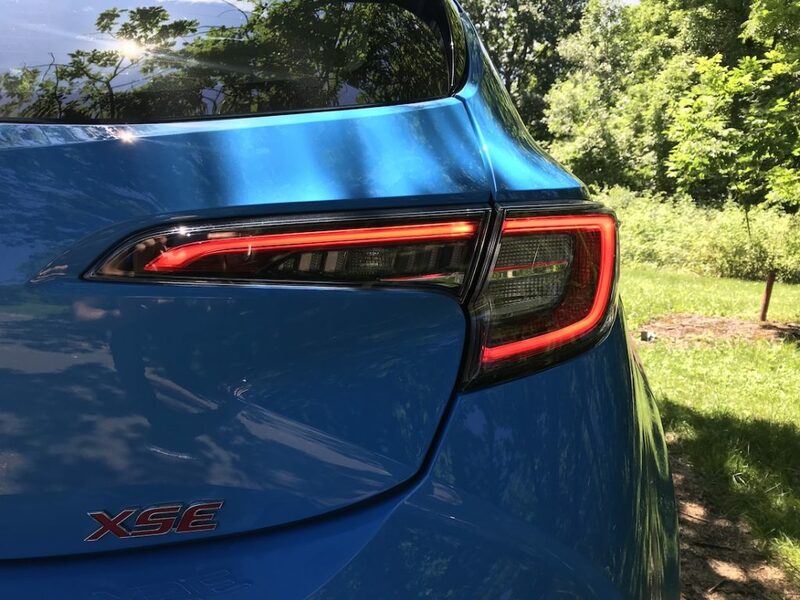 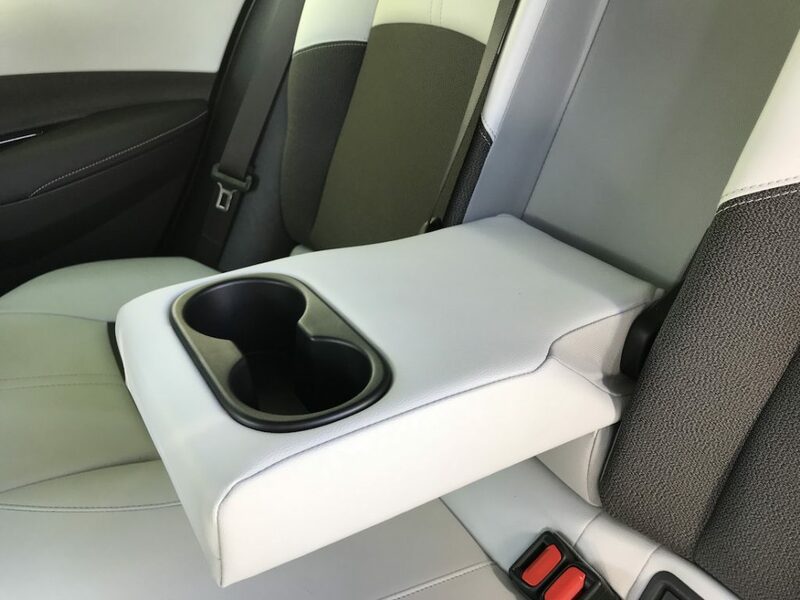 From the inside, designers and packaging engineers did a superb job utilizing all the space available and making the Corolla Hatchback feel much more expensive than it is. 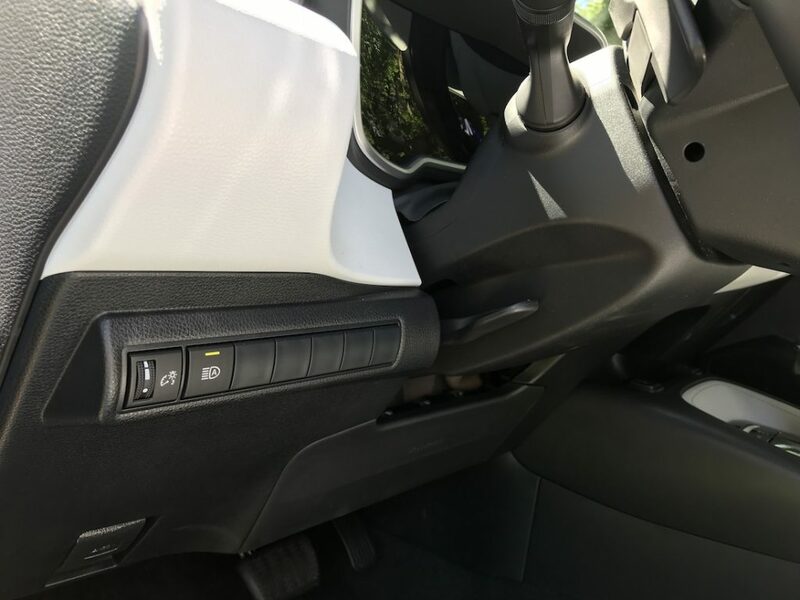 Entry and exit could be made a bit easier if the car were an inch or two higher. 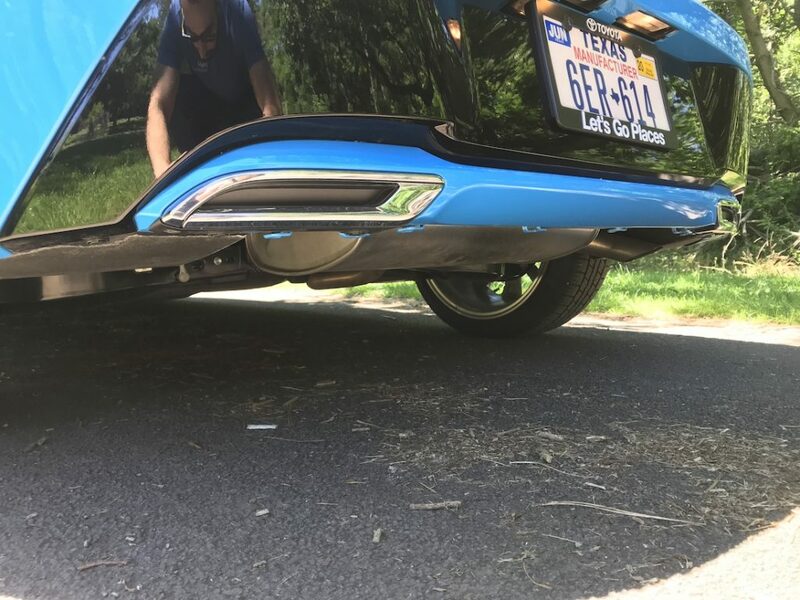 The car feels low to the ground compared to other vehicles in the same class. 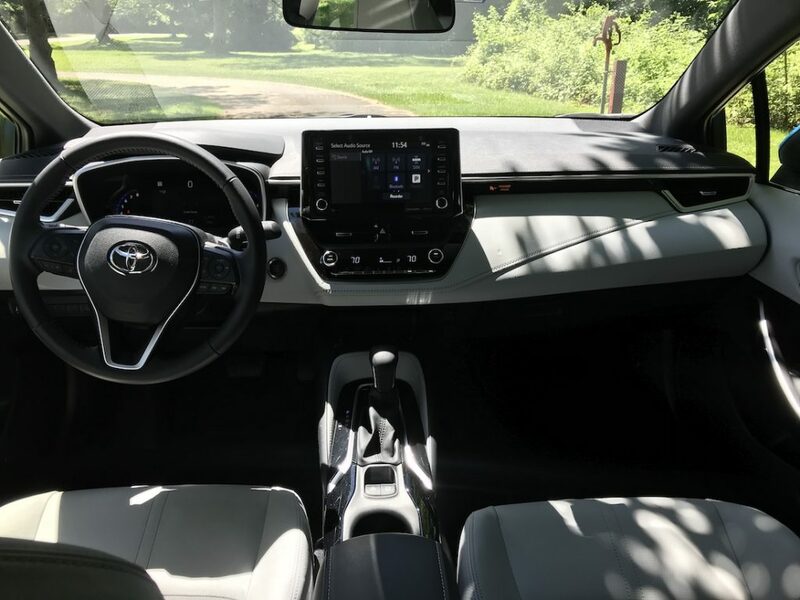 The two-tone upholstery and dash look and feel premium, and the dash looks very modern with the new larger infotainment screen and large 7-inch screen in the instrument cluster. 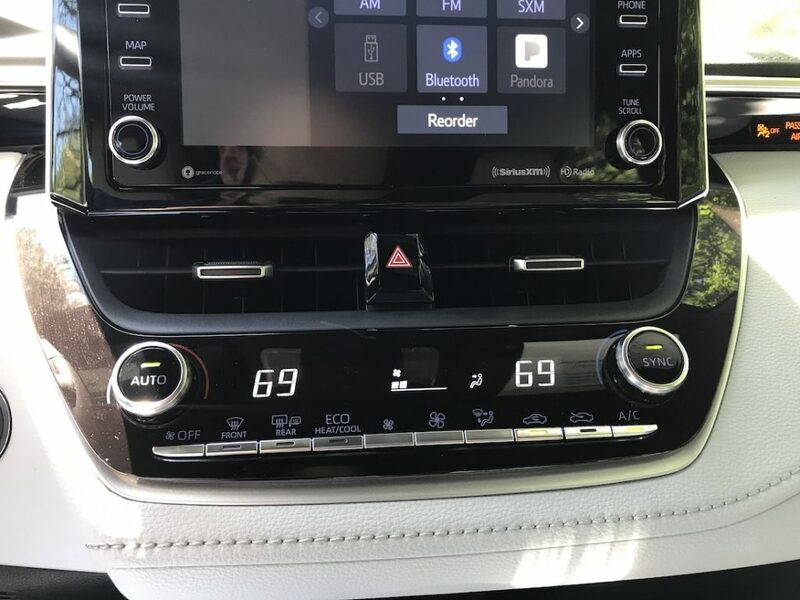 The retention of knobs and buttons for all the important stuff like volume, tuning, and HVAC is intelligent on Toyota’s part. 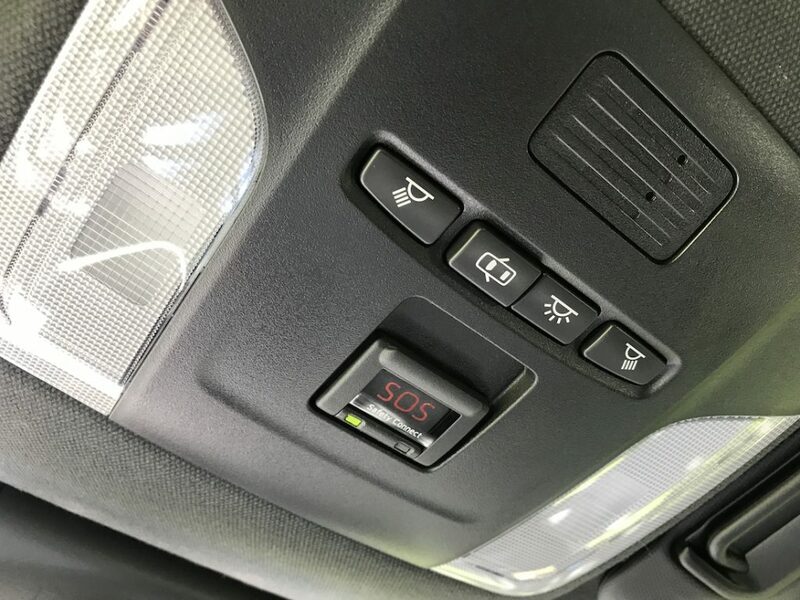 Refinements such as reducing the lettering on switchgear and using universal symbols also contributes to a safer driving experience, though we’d like to see the size increased a bit. 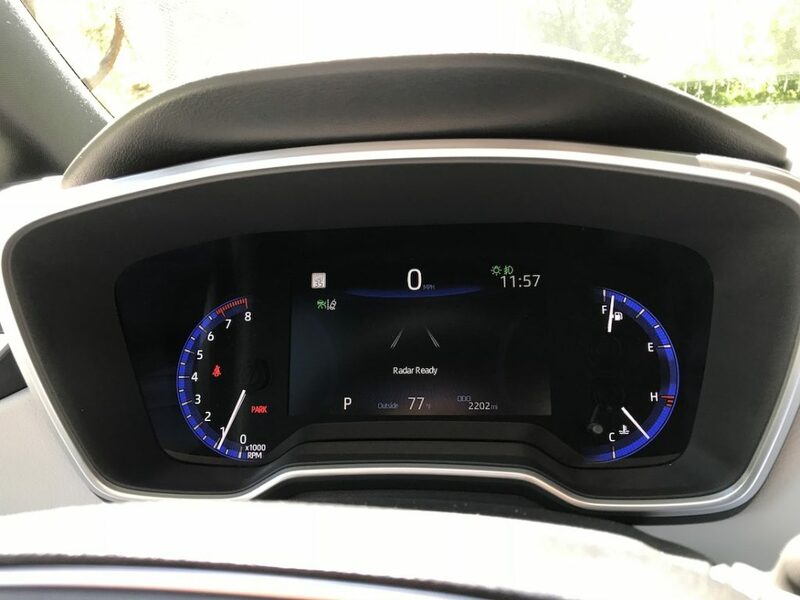 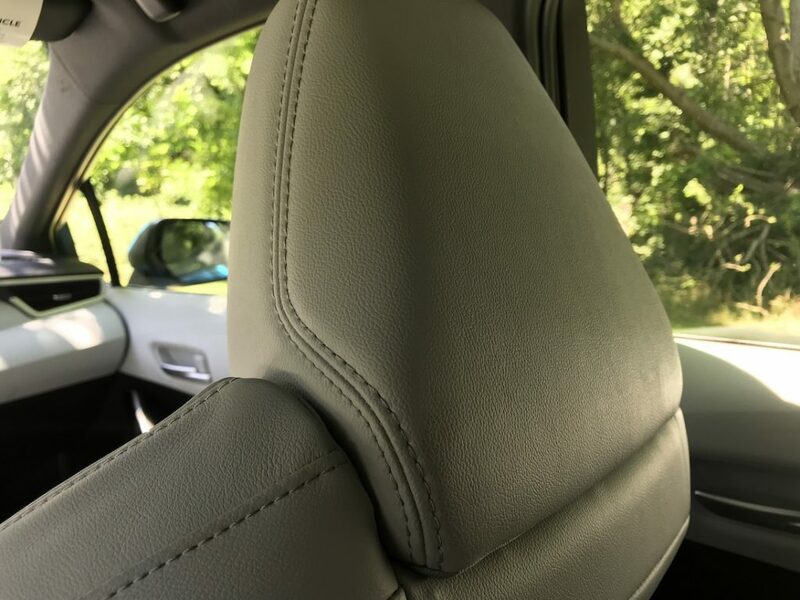 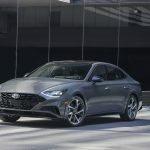 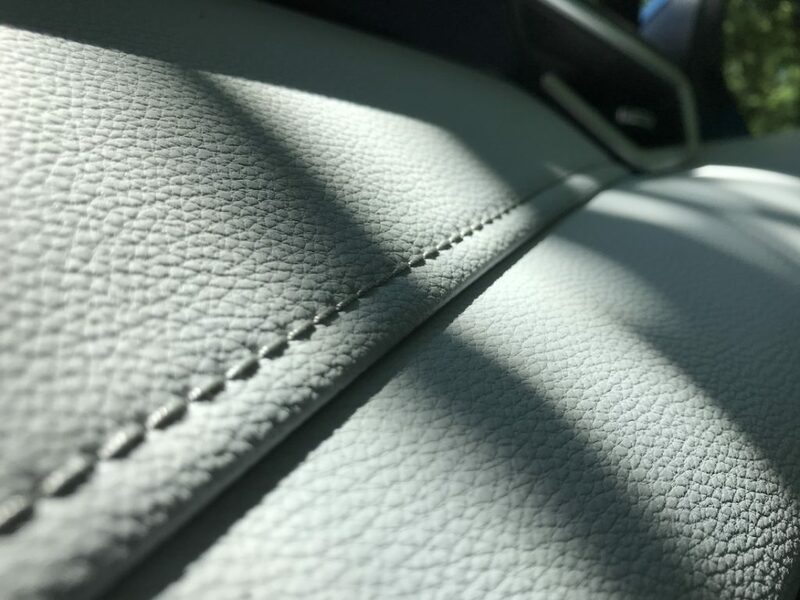 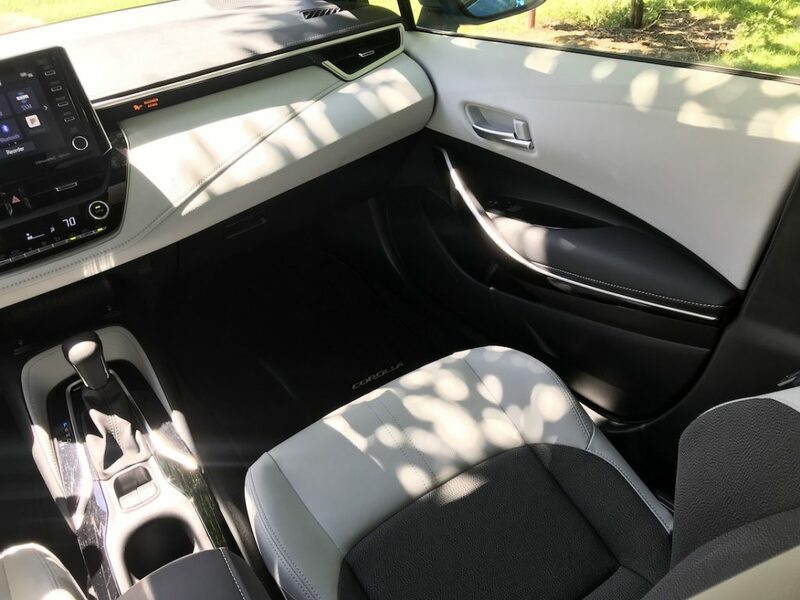 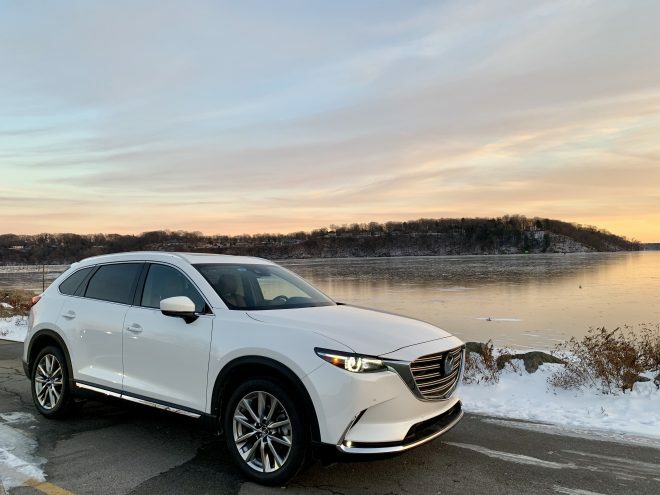 Features like auto brake-hold, an electronic e-brake, multiple USB ports (including the one hidden beneath the dash), a power seat with power lumbar, and auto up/down on ALL windows are pleasant surprises for this class. 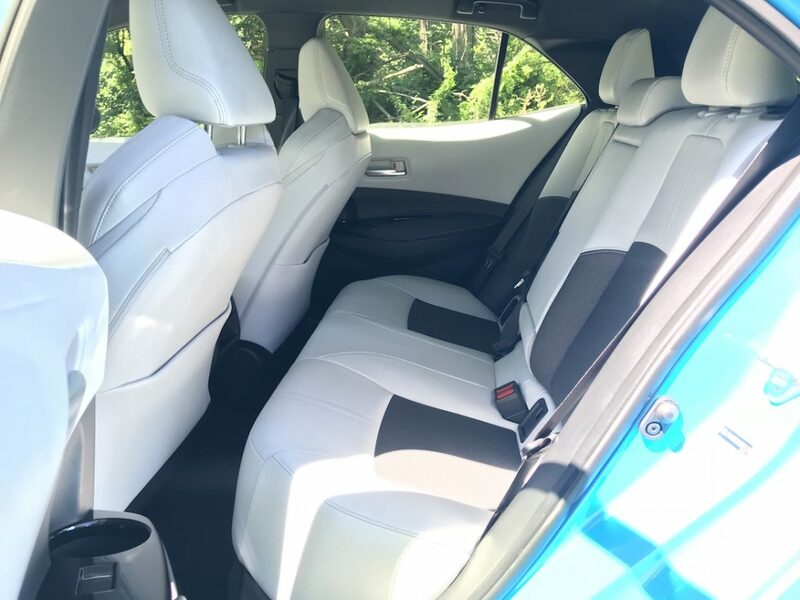 Space up front is plentiful, and the seats have good padding, but legroom is tight in the back. 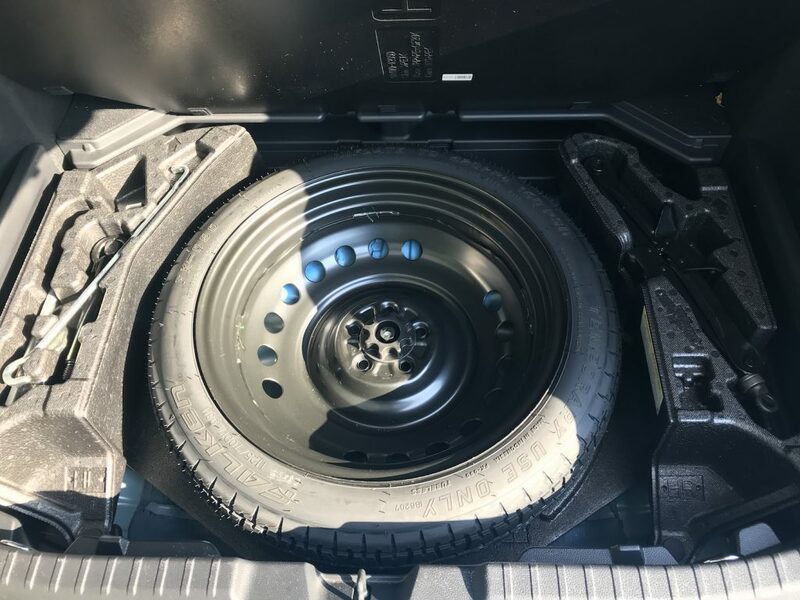 Cargo room is good, but the slanted hatch cuts into the boxy cargo area shape.We were surprised to find a real spare tire under the cargo floor. 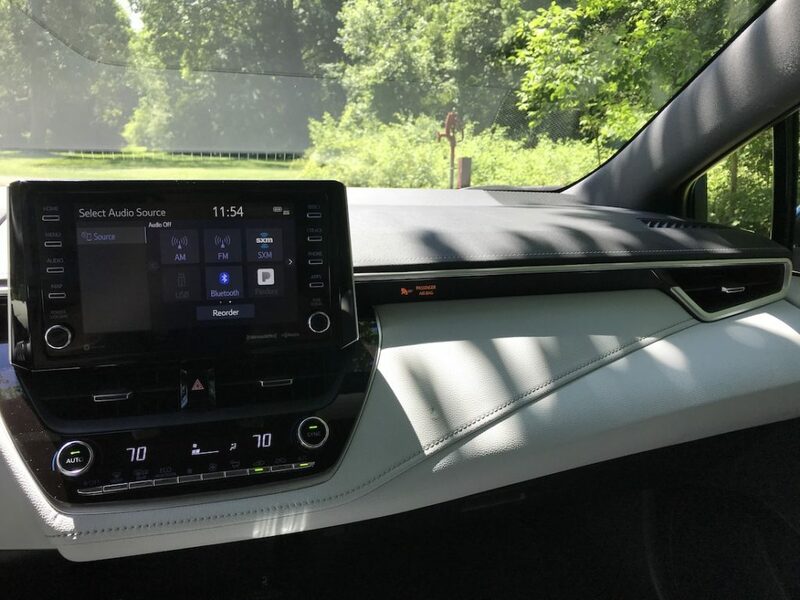 But the biggest surprise is the infotainment software inside the 8-inch touchscreen. 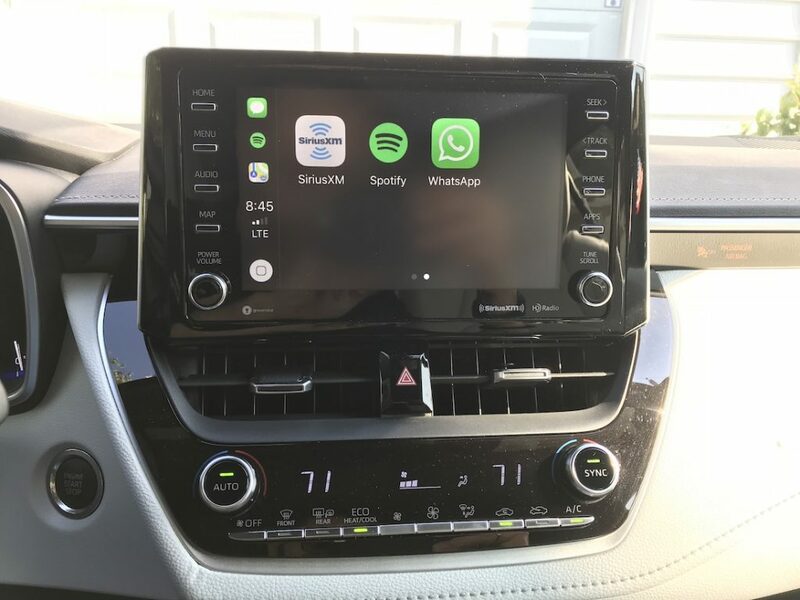 Technology like Apple CarPlay and Amazon Alexa services are now part of the Entune system and work perfectly. 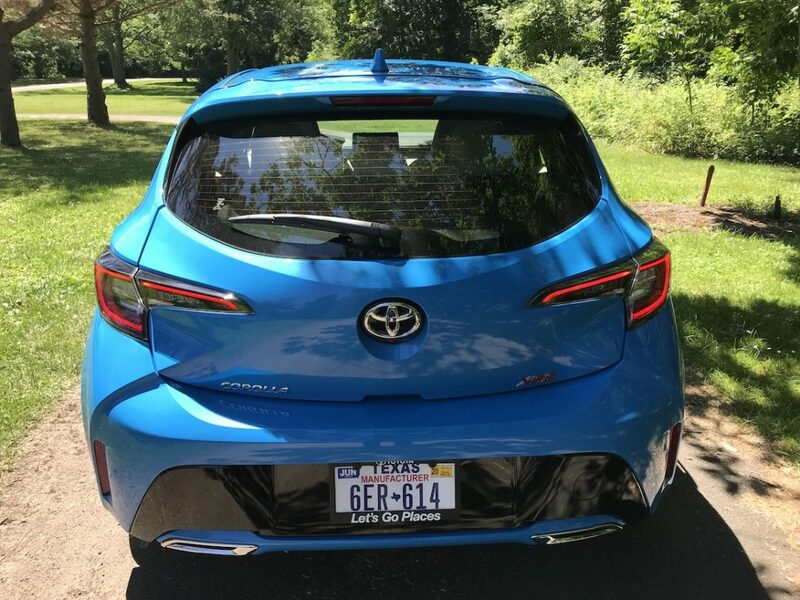 Connected services through Verizon allow the Corolla Hatchback to be started, locked/unlocked, and so much more from a tap in the app. 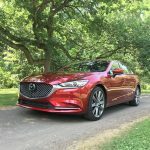 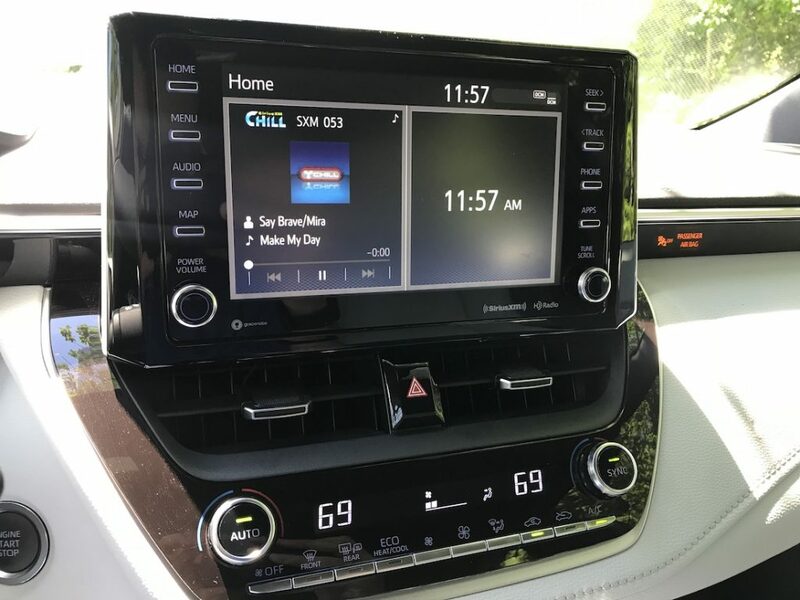 These features really bring this car into the modern era of connectedness and convenience, making our lives better. 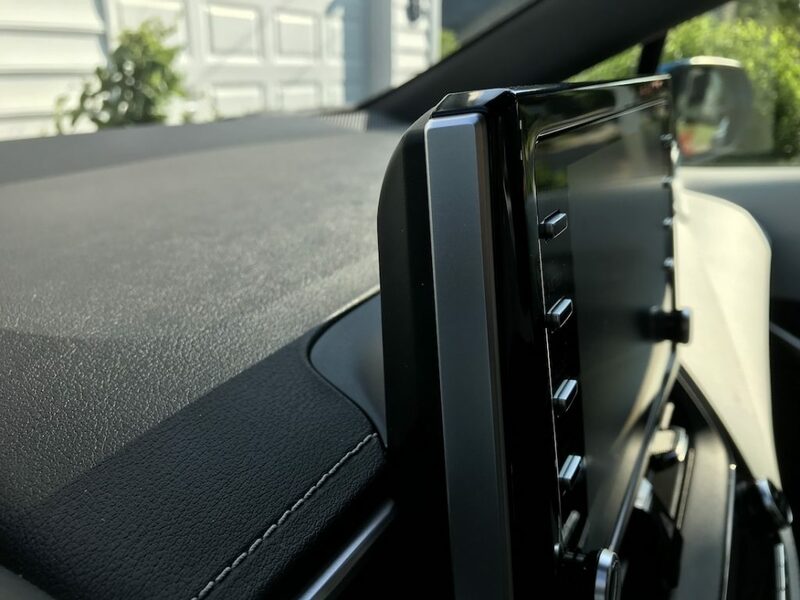 A tray ahead of the shifter houses the Qi wireless charging pad–we’re glad to see it, and it worked perfectly during our week of testing. 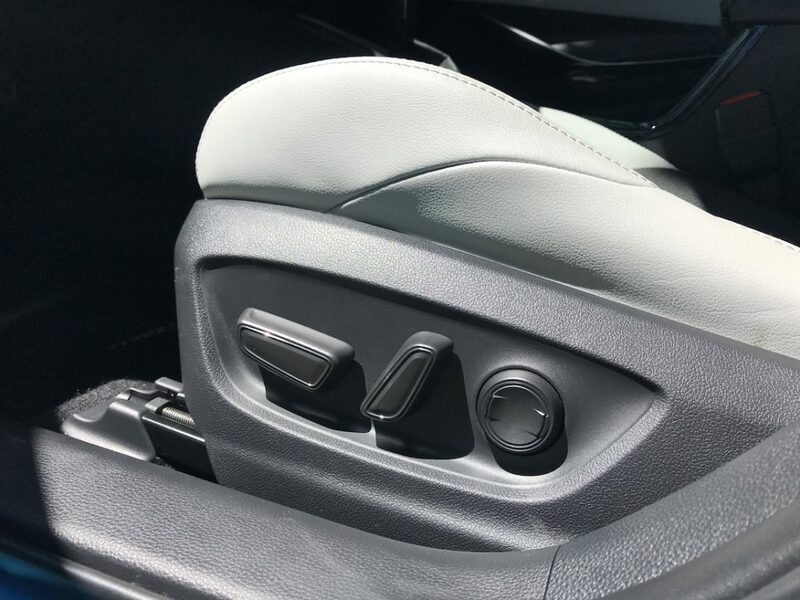 Most important of all the features offered is the standard suite of safety technology. 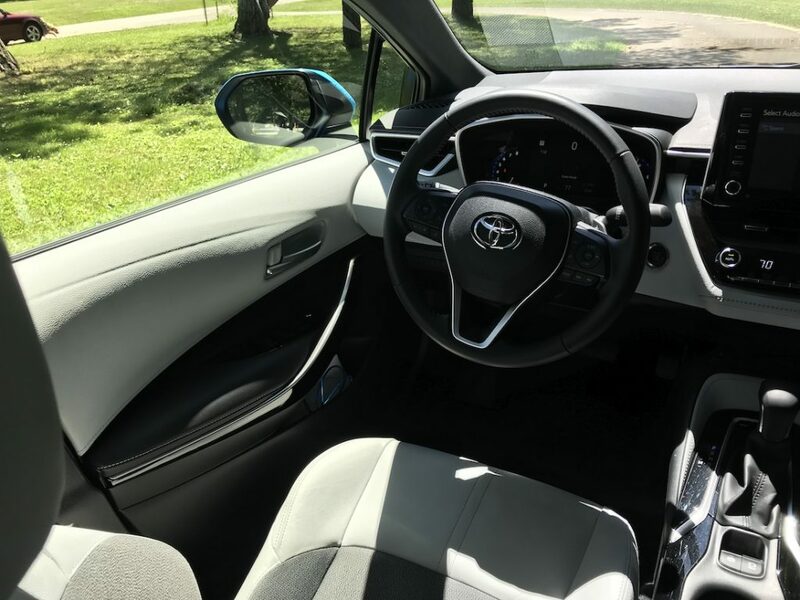 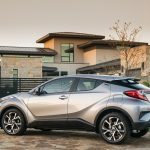 Dubbed Toyota Safety Sense 2.0, the second gen hardware and software package adds new active safety technology and capabilities that enhance protection. 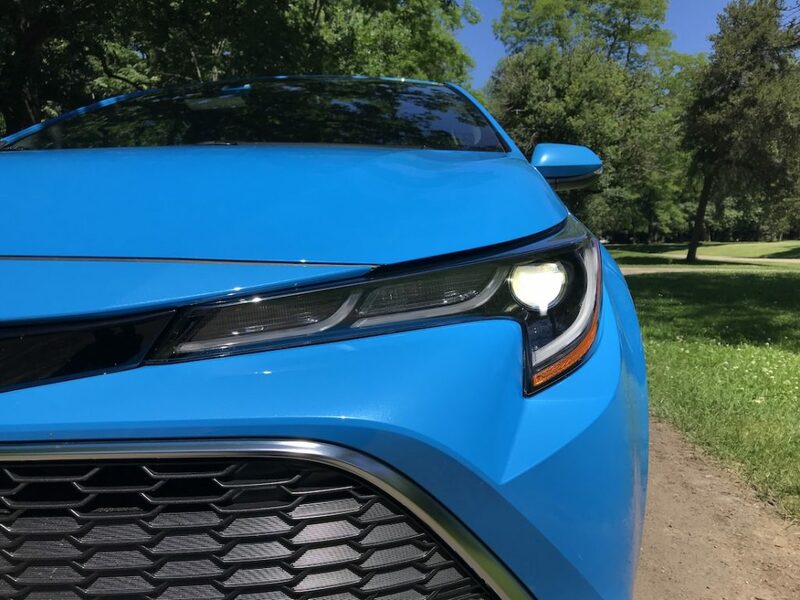 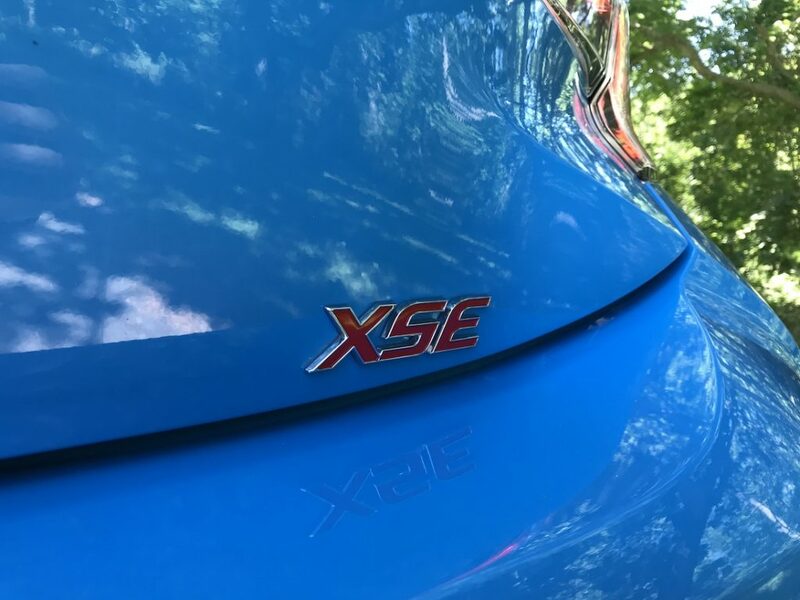 This is the most advanced suite of safety systems in this class and if safety tech is #1, then the Corolla Hatchback should be at the top of the list. 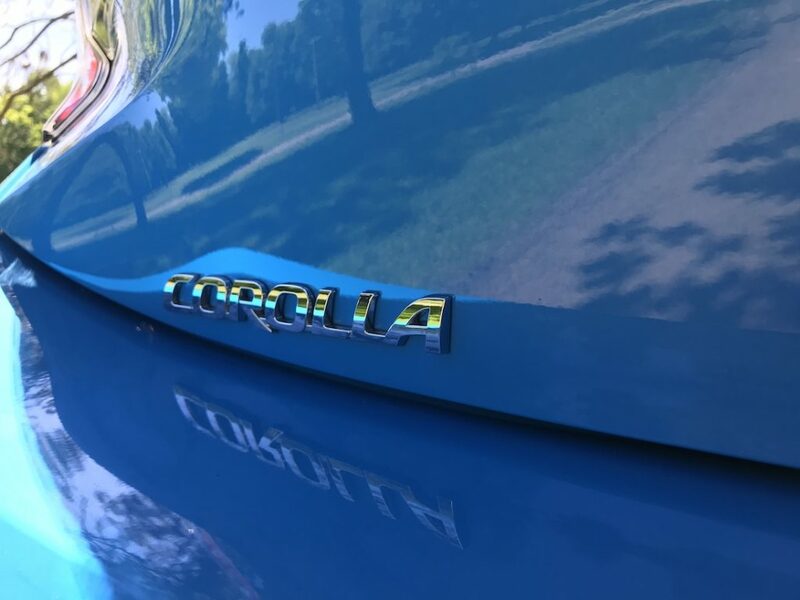 Full-Speed Range Dynamic Radar Cruise Control is standard on all Corolla Hatchbacks except those with a manual transmission. 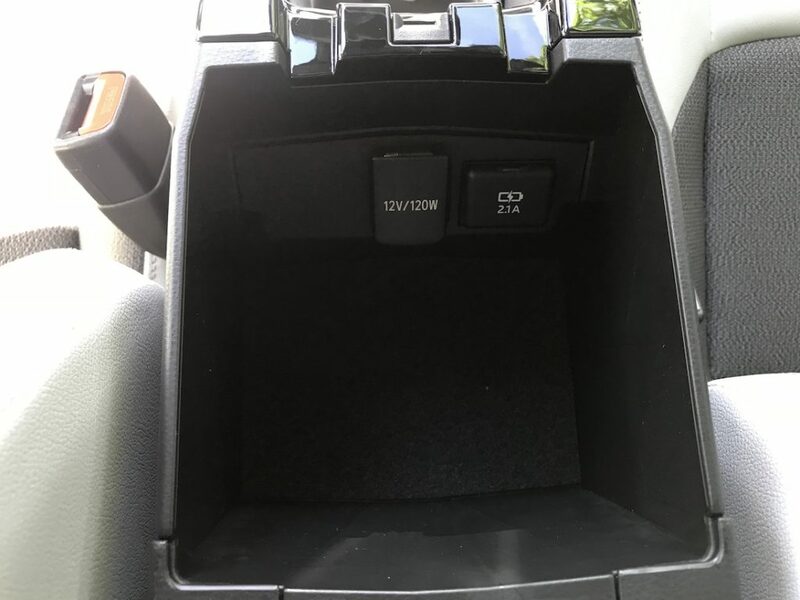 Those with a manual are equipped with DRCC which disengages at lower speeds. 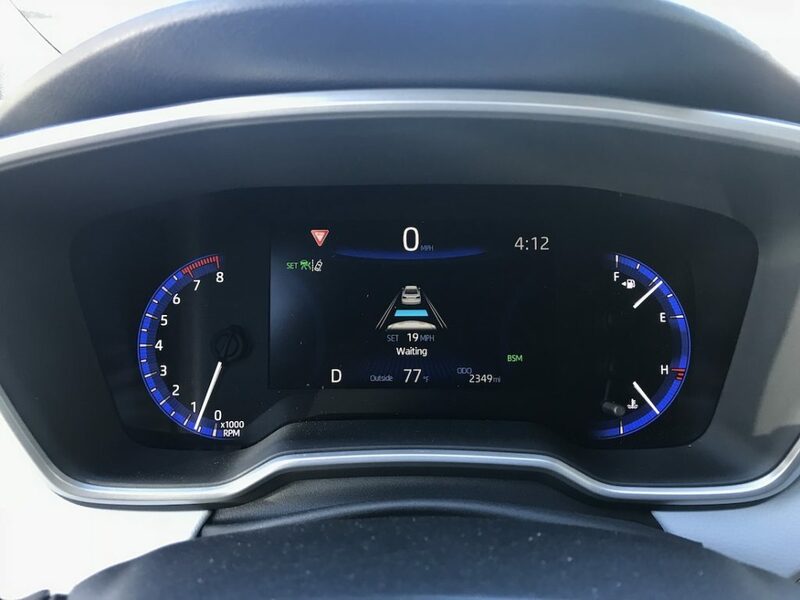 Full-Speed Range DRCC is an adaptive cruise control that is designed to function at speeds between 0 to 110 mph and enables low-speed speed matching, stopping, and acceleration/deceleration relative to a preceding vehicle traveling at a slower speed. Responsiveness, vehicle ahead cut-in, and distance control have all been enhanced. 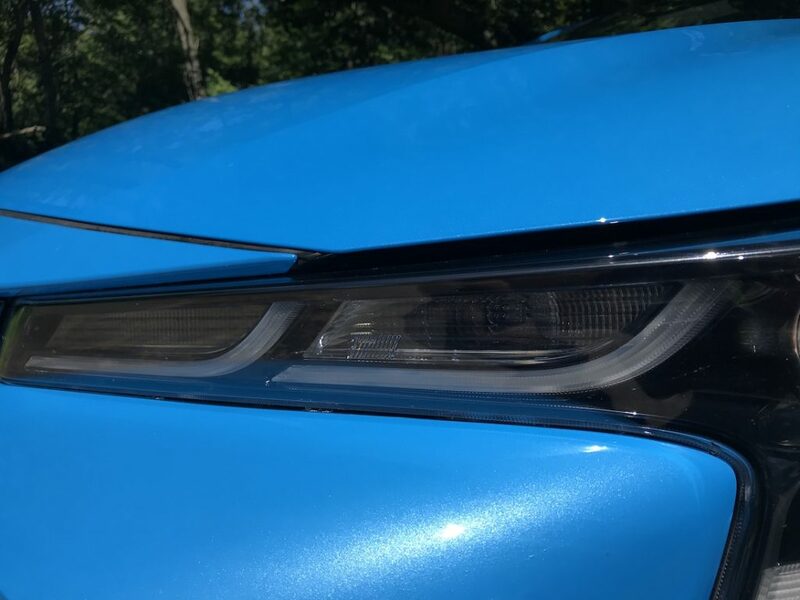 Toyota says that Turn Signal Linked control has also been added for a more natural response, allowing the system to know you’re changing lanes and therefore to respond more aggressively to move forward if needed instead of slowing down as most systems that aren’t linked do. Lane Departure Alert with Steering Assist detects the road’s edge, in addition to the pre-existing capability to detect visible lane markers, and if unintentional lane deviation is detected, the system alerts the driver with audible and visual warnings. 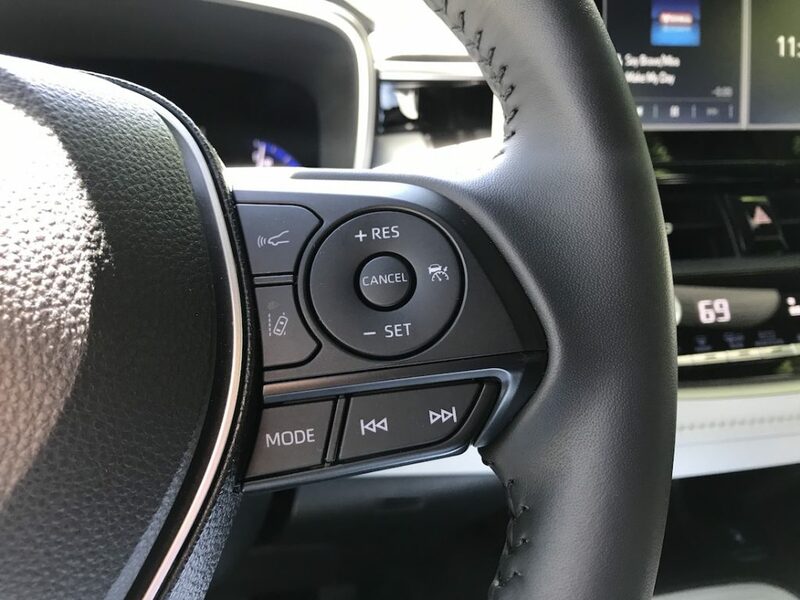 Steering Assist provides small corrective steering inputs momentarily to help prevent the vehicle from unintentionally leaving its lane. 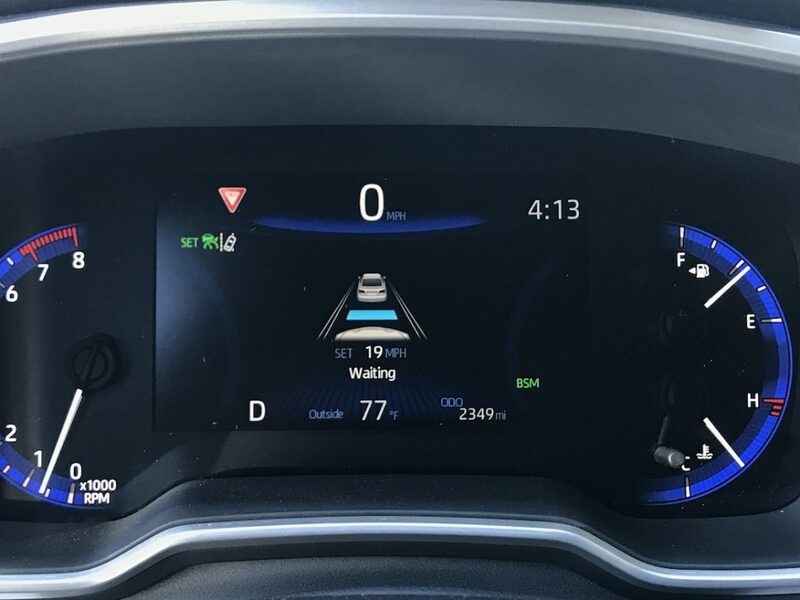 Lane Tracing Assist can be enabled when using DRCC and has the capability to recognize white or yellow lane markings or the path of a preceding vehicle if lane markers are temporarily not available. 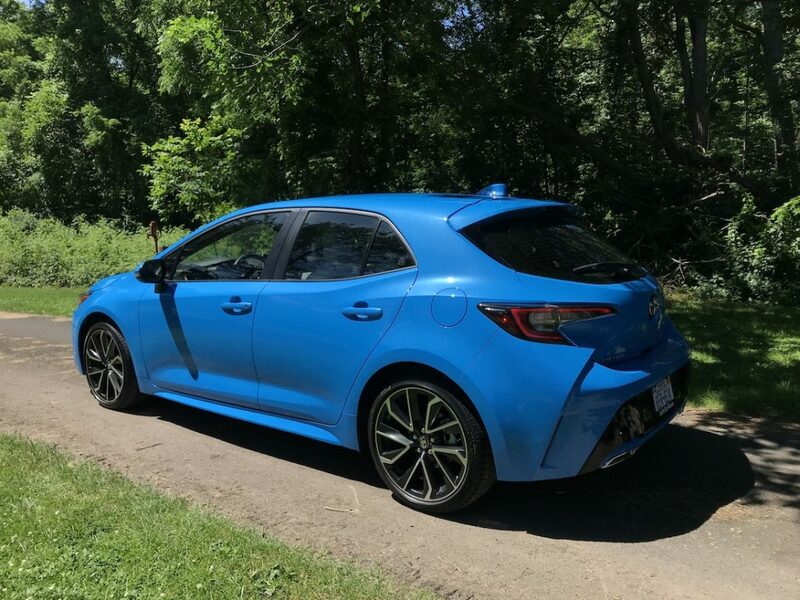 It identifies and actively maintains the Corolla Hatchback in the center of the lane by providing steering assistance to the driver. 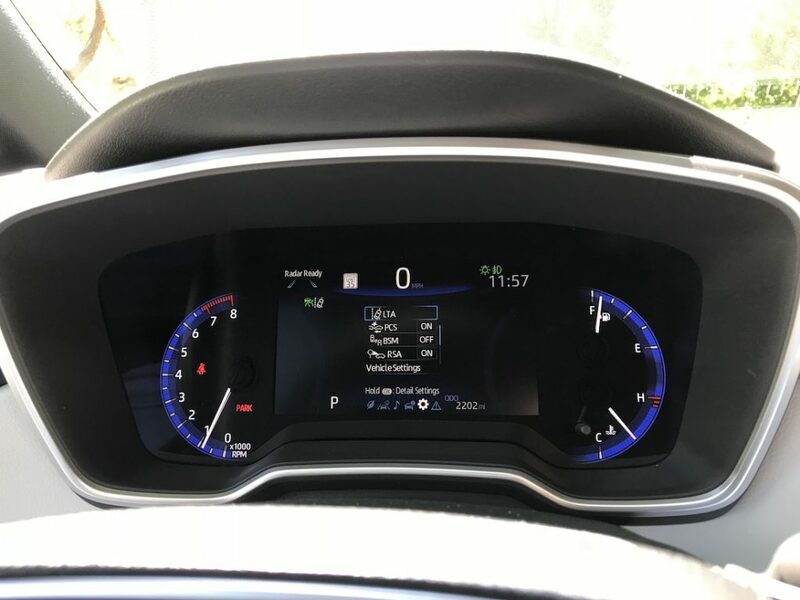 It’s a totally hands-on system that reduces driver fatigue and supports safe driving, especially in traffic congestion or long highway trips. 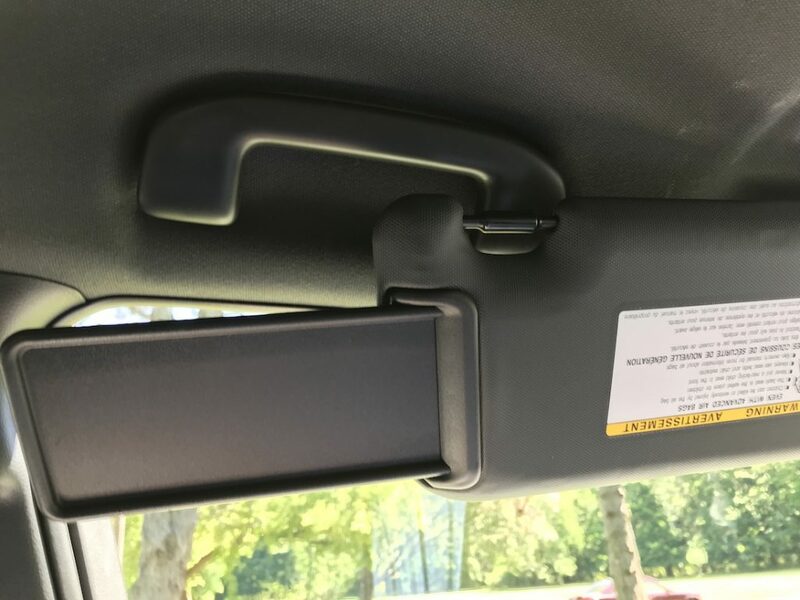 Road Sign Assist has the capability of identifying Stop, Yield, Do Not Enter and Speed Limit signs and display a warning (visual and audible alerts). 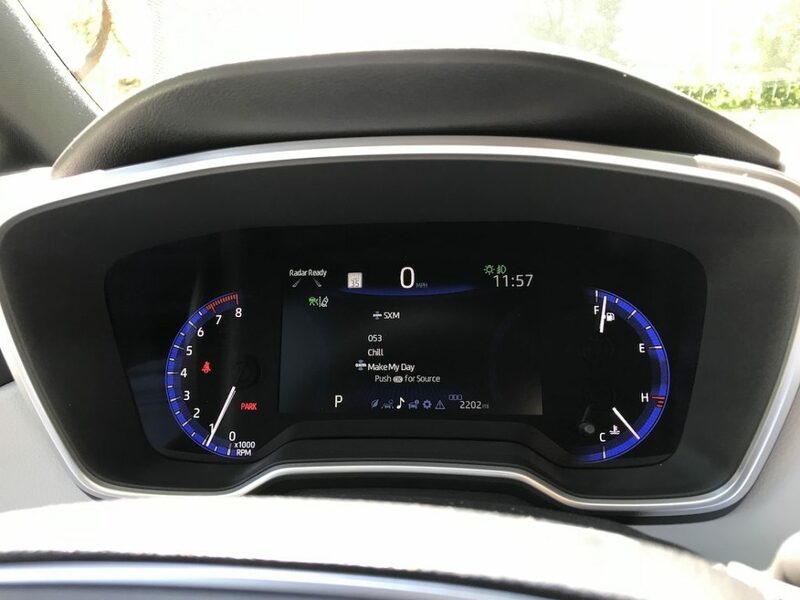 Alerts vary based on sign type and are displayed on the Multi-Information Display. 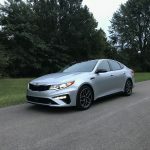 Overall a very good review. 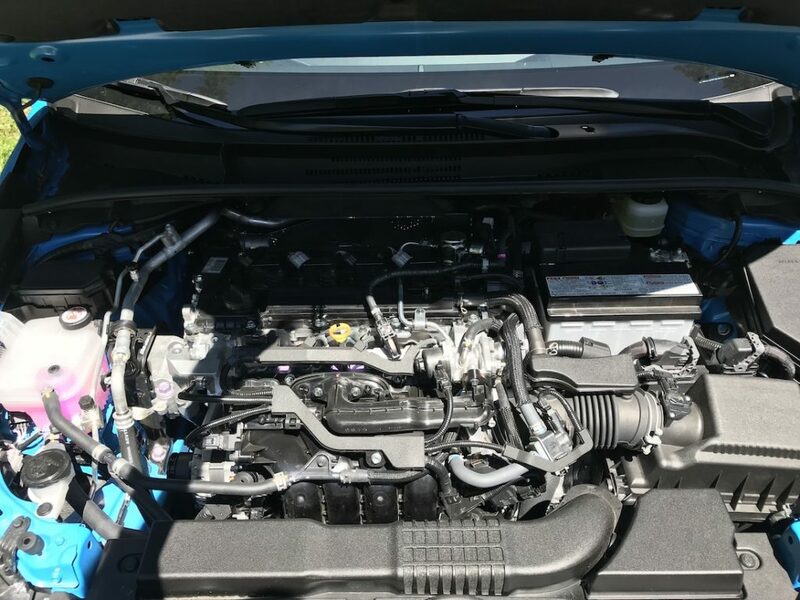 A couple of minor issues: the engine isn’t turbocharged and you misspelled “unique”.